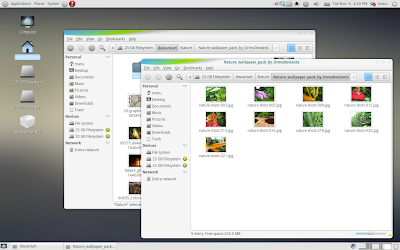 Download 'A New Start' GTK Theme. You also need to download and install Awoken Icon Theme for best results. And the wallpaper can be found here. In the screenshot above, I used a slightly modified Awoken icon theme which comes as default with Elegant GNOME Theme pack. And the wallpaper used is Vapor. GTK theme is just a small part of the package. 'A New Start' pack comes with GTK theme, Metacity, Gnome-Panels, CoverGloobus theme, beautiful Conky configurations and even a custom Firefox start page.